“Recorded in Los Angeles’ Wiltern Theatre one December afternoon as part of the Jazzvisions project, this was released four years later almost as an afterthought to the series — and even many of Hancock’s electric music fans weren’t aware it was out. 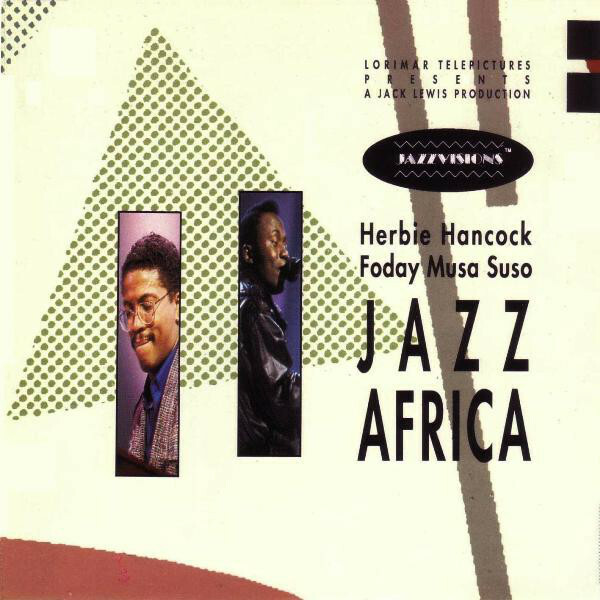 A pity, for this is one of the great unheralded Herbie Hancock recordings, a rock-’em, sock-’em, live tour de force that fuses Hancock’s electric keyboard work, Foday Musa Suso’s kora, incantory vocals, and scraping violin, and a thundering African/Caribbean rhythm section. The CD opens and ends quietly with the delicate, folk-like music introduced on Village Life but the record is dominated by two lengthy, madly swinging workouts for Hancock, Suso and the rhythm section, which is anchored by Santana’s ageless Cuban-born percussionist Armando Peraza. Digitally recorded live at the Wiltern Theatre in Los Angeles, CA in 24-Track Sony Digital Stereo by the Record Plant remote truck. Mixed and edited at the Record Plant. © 1990 PolyGram records, Inc.
℗ 1987 PolyGram records, Inc. Manufactured and Marketed by PolyGram Classics and Jazz, a division of PolyGram records, Inc., New York, New York. Part of the Jazzvisions™ series.